Are you looking for the fastest way to get your PIO to OCI converted? If you have a PIO card (Person of Indian Origin visa) and are looking to get it transferred to an OCI Card then Reload Internet is the place to come. We will take care of the entire process of transferring your PIO to OCI Card. Once you book an appointment with us, we will provide you with a clear list of documents that are required to transfer your PIO to OCI and we will take in account your circumstances. We will then complete all parts of the OCI application form including Miscellaneous and Section B. We will take your OCI photo instore (included in the cost), upload and resize your OCI photo and upload your signature to the OCI form in the digital format. Best of all, is our price for PIO card to an OCI Card is £39.99 if you have your own passport photos or £45 if you wish for us to take them for you. Further, we Guarantee you will be approved by VFS or we will redo the whole OCI application for you. It can not be fairer. Book an appointment with us – please select OCI premier service for PIO to OCI. Once a booking is made we will confirm the OCI documents that you need for your application before your appointment with us. Once you arrive at our Paddington branch, our staff will fill in Section A of the OCI application with you and prepare your documents for upload as well as digitise your signatures and prepare your OCI passport photos instore. All forms will be printed and prepared for you in store. We will then make a priority booking at your nearest VFS branch and you will simply hand in the file we have prepared for you to them. You will then receive your OCI Card within 6 – 8 weeks. Advice on which documents to include with your OCI Application according to your circumstances. Passport photos printed in store. We will give you Printouts of you OCI Application Form required for the Embassy and one copy for your records. 4 * hard copies of Indian passport photos (required for the Embassy 2*2 inch (51*51 cm) will be attached. Our service includes Printed B/W copy of application and appointment letter. We reduce the price of this package to £40 if you bring in your own OCI photos with you – however our Guaranteed pass service will not be valid if your OCI application is declined because of your photos. You are able to come in store to Paddington for your PIO to OCI application we can do it all for you. if you are unable to visit us instore please follow the link if you do not wish to visit us instore and we will do for you without needing to visit us. Just fill in a few forms for us and we will post you everything you need. A fully completed OCI Application Form that is OCI Application Ready including print-outs and copies of your online application forms. Digitally uploaded photographs and signatures for your OCI Application (mandatory requirement). Our Indian Embassy approved passport photo machine, and fully trained staff will ensure that your OCI application has everything that is required. A full set of hard Copy OCI photos which are suitable for the OCI Application form (if you have opted for the Premier Package). Should you wish to purchase OCI Photos separately instore and are a walk-in customer you are welcome to purchase them for £14.99 for 4 photos. In short, after we will complete everything you need for your PIO to OCI application and you will have everything you need to submit to VFS – we guarantee you will be accepted or we will redo it for you free of charge. OCI Passport photos specifications include the background colour, size of Indian passport photo, and EVEN the angle of the face as you look at the camera. A kiosk can not help with this, and we have seen many OCI applicants fail as a result of errors in applications or non-qualifying passport photos. If you just require your Indian OCI Passport photo, we can click and print these instore whilst you wait and we charge £14.99 for Qty: 4 (hard copy) photos. This does not include digitization – if you require this – we charge £4.99 extra. which is why we recommend going for the complete OCI package which includes everything you will need including support and checking of your OCI online applications forms. 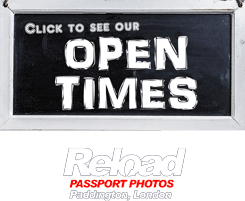 We have attached an image below and not many Passport Photo studios in London have the specialist equipment required to get an Indian Passport Photo approved. Is Reload Internet Affiliated with the Indian Embassy? What we do and some of our terms. 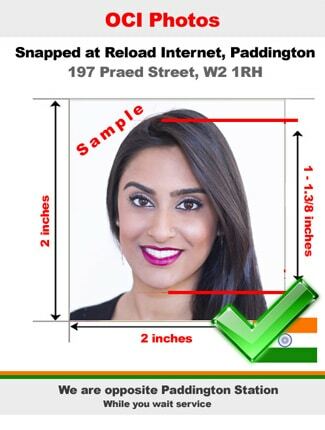 Reload Internet is NOT affiliated with the Indian Embassy or VFS Global in Paddington. We provide consultancy services and OCI application form filling help for the OCI and Indian form filling process. We will scan in all of the documents you require and also digitise photos. We however can not offer refunds as we are service based. We are always happy to make right anything that needs doing. We can not be held responsible for the distance travelled or travel expenses. By using our service, you agree to indemnify and hold harmless Reload Internet and its staff and no warranties are given. How long will my PIO to OCI application take to complete? That’s a great question. Once the application is submitted to VFS Global Paddington Indian Visa, OCI, Passport and Consular services centre and for it to be issued it takes approximately 6 to 8 weeks. We have sadly seen it take longer – and sometimes, much sooner. So book an appointment today for PIO to OCI application help.